One of UK Export Finance’s regional representatives, Stuart Stoter, tells us about a typical week helping exporters get a better understanding of their export finance requirements. My career in finance started nearly 40 years ago as a happy accident! After a degree in zoology, I took a job working for Midland Bank, International Branch in Bristol to fill a gap before I started my career as the second David Attenborough. I stayed for a while, working in 4 different banks for 38 years, before joining UK Export Finance (UKEF) in 2014. I’m one of UKEF’s export finance managers. We’re based across the UK and work with companies of all sizes and sectors, providing guidance and, where possible, identifying an appropriate finance or insurance solution to support export transactions. My patch is the South East – I cover Berkshire, Oxfordshire, Hampshire and the Isle of Wight. It’s a big area and to put this blog together, I kept a diary of a typical week. Hopefully it will give you an insight into the work I do, the variety of companies UKEF supports – and maybe even prompt you to get in touch with me or your local export finance manager if you’re considering exporting! Lots of calls today, including a catch-up with a Reading-based exporter, who has won a significant contract in India. We’re looking to start UKEF’s first ever short-term finance export working capital facility deal with Indian bank ICICI. If it’s successful, it will support the company’s growth and the future of their UK operation. My morning begins with a meeting at OxLEP, Oxford’s local enterprise partnership. They provide loans and grant funds to help growing businesses. We’re working together to make effective referrals, so exporters can find the information they need quickly and easily. In the afternoon, I visit a fantastic engineering consultancy business for marine and maritime matters, which has a huge tank for testing their models with radio controlled boats. UKEF will be helping them with guarantee support on a major project in China, designing and building a testing facility for one of the world’s biggest shipping lines, an exciting venture that should see them go from strength to strength. A visit to a Surrey business that provides training for helicopter pilots and crew specialising in search and rescue across the world – dramatic stuff! They’re looking at credit insurance and potentially medium-term support to support their bidding on projects in Bangladesh, Mexico and Pakistan – another example of how UKEF support can make the difference. 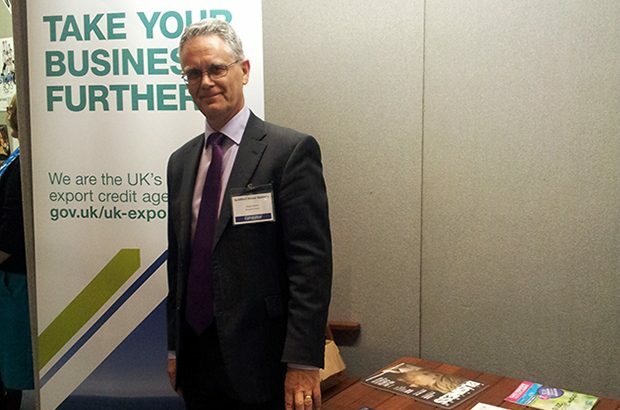 I’m always looking to raise awareness of UKEF’s services and products in the export community. Today I discussed a series of round tables with PwC and the Department of International Trade. We aim to invite 10-15 business owners, who are interested in exporting. We avoid a fixed agenda so they can shape the discussion – it’s a valuable learning experience for us too and helps make sure we’re providing the services they need. I start the day with an engineering firm that designs and builds equipment used to find hidden structural damage within turbine and wind farm blades. They‘re interested in bond support and working capital, two UKEF products that really help exporters fulfil valuable contracts. Next up is an Oxford-based firm in the renewable sector who are interested in exporting to Kazakhstan. They’ve designed new equipment for use in remote locations that converts waste gases from bio-digesters into liquid fuel to replace oil. Their future looks promising and we’re ready to help them succeed in their chosen market! Today I met two companies that develop servo mechanisms and need finance to grow. They work in different areas – one builds earthquake tables for building design and the other fits micro mechanisms in aircraft, rockets and satellites – but both share a concern about issuing performance bonds to buyers and short-term export working capital. I’m happy to report we’re well-placed to support both to realise their ambitions. I end a busy week with Innovate UK, a government organisation that provides grants and loans to fast-growing technology firms, to discuss referrals. They suggest a marine engineering firm in Southampton that might benefit from UKEF services – that’ll be next week’s first call! Keep in touch. Sign up to email updates from this blog. Follow UKEF on Twitter or connect with us on LinkedIn. The official blog of UK Export Finance (UKEF), providing expert insight on the organisation's work and all aspects of export finance and insurance.